USA Renovations has provided polished concrete services not only in the DFW metroplex but also the 48 states. With integrity + results being the focus of the service we provide, we won’t settle for quality other than the best. We manage several crews which allow us to fit your needs, your schedule and your demand. Whether you are a general contractor or direct buyer, we want to work with you and provide the best-polished concrete service possible. 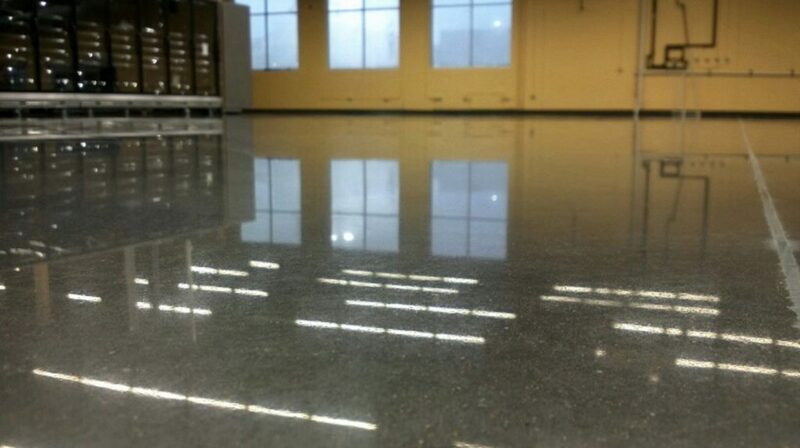 Polished concrete floors are the latest trend in office spaces, retail spaces, manufacturers warehouses, and homes. This is simply because they are easy to maintain, extremely cost effective, and have a beautiful mirror-like glossy finish to them that will outlast any other surface available on the market today. 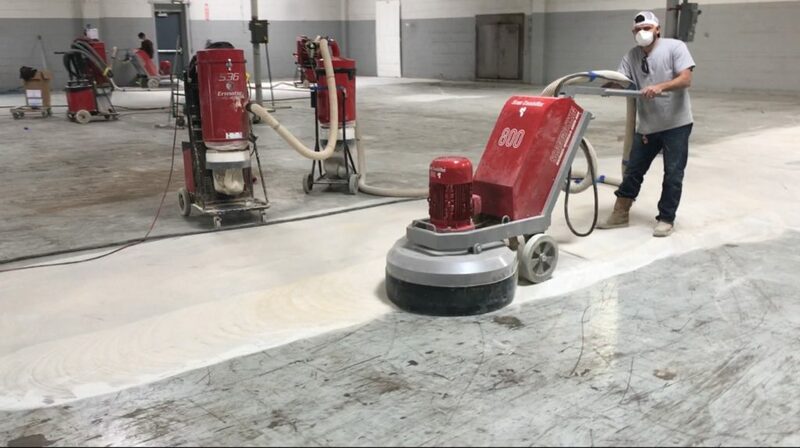 There are a variety of options when choosing your polished concrete flooring, including the integral or penetrating stain color, the gloss level, and aggregate type. Our professionals will assist you in the processes used to reach the desired finish you request. Whether you’re looking for a super shiny floor or a subtle reflection, the options are at your discretion. Low maintenance: in high traffic areas such as commercial buildings or office spaces, having low maintenance floors is a necessity. 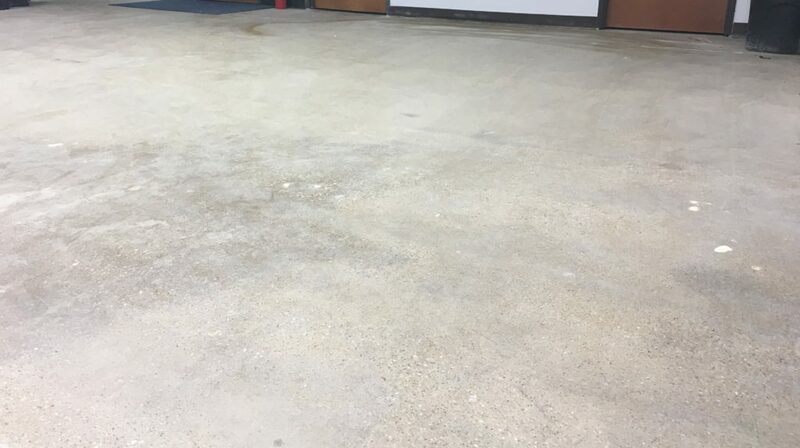 To keep polished concrete floors clean and “like new”, all it needs is mopping using a dust mop on a regular basis, using cleaning product semi-regularly. There’s no need for messy coatings such as wax. Labor costs are cut when compared to wood or carpet flooring because polished concrete requires less cleaning time. Long term durability: foot traffic from employees or customers, forklifts, carts, etc. can be harmful to many surfaces and demand replacement every 5 – 7 years. With polished concrete being a permanent floor option it is no wonder why many large retailers find this surface to be there preferred choice. Free from moisture transmission issues: Alternative flooring options such as tile, wood or carpet leads to issues such as adhesive deterioration, bumps, ridges, color changes, mold, bacteria growth, peaking or curling, all caused by sealing of the floor, not allowing it to breathe. Polished concrete floors simply don’t have these issues. Efficient long-term floor: Going green or simply want to do your part in making your business or home eco-friendly? Polished concrete is a great flooring option for sustainability. When left exposed, concrete floors have two functions: they are the foundation slab along with the finished flooring. By eliminating the need for wood, carpet or tile, you save resources that would eventually need replacing. Go Green! Earn LEED Credits: Recycle old concrete floors or start fresh with polished concrete which can earn up to 5 LEED Credits. The Leadership in Energy and Environmental Design has listed polished concrete as a LEED certified project. Whether it be a reduction of adhesives by eliminating wood or carpet tile or optimizing energy performance due to less requires lighting we can help you earn LEED Credits and Go Green! In simple terms, polishing concrete is similar to sanding wood. We utilize large industrial 1200 Lbs. grinding machines that are equipped with a planetary system. This allows the grinder to hold a set (9) diamond-impregnated disks that are the size of a hockey puck. These pucks are impregnated with diamond fragments and categorized into grit ratings such as 100, 200, 400, etc. depending on how course or fine these pucks are will determine their overall grit rating. Similar to sandpaper on wood, these disks are used to grind the concrete surface down to refinement and desired aggregate then brought back up in stages which are grinding, honing, and polishing until the desired level shine is achieved. POLISHED CONCRETE: WHAT IS DENSIFIER AND WHY DOES IT MATTER? Densifier is a key role in the process of polishing concrete. During the process, a penetrating chemical called “densifier” is applied. The chemical then sinks into the concrete as it chemically reacts, causing the surface to harden to a much higher surface PSI. This protects the concrete from the inside out while allowing the best possible polished concrete gloss rating. This eliminates the needs for a topical coating, reducing maintenance significantly. The most common question we get is “How is concrete polished?” We have several videos of the process on our YouTube channel where you can see one of our mechanical grinders in action. To keep things simple, we break our process down into three main steps: grinding, honing and polishing. Using coarse diamond segments which are bonded in a metallic matrix, minor pits, blemishes, light coatings or stains are removed from the floor. Most concrete floors begin with 50 Metal to 100 Metal. Then, lower or high grit segments are used to reach the desired finish. Grit segments are dependent on the owner’s selection in the initial planning phase. Once the grinding process is finished and the desired surface is achieved, we switch to our Hybrid/Transitional Diamond Impregnated Segments. These finer resins and metal/resin matrix tooling pucks remove any of the aggressive abrasion left behind by our metal bond diamond segments. Anywhere from two to four steps follow, ranging from 50 hybrid (metal and resin hybrid) to 200 resins. From there, we enter into the polish process. The polish process begins at 400-1500 Grit Diamond Impregnated Resin Segments. This process will continue with progressively finer grits until the preferred gloss is reached. Accounting to the Concrete Polishing Association of America (CPAA) there are 2 ways to classify a final polished concrete finish. Below is a how our professionals measure Gloss and Aggregate. The level of gloss is the rating in which a finish concrete slab reflects the ambient light. It is what gives polished concrete its sheen. Our professionals are skilled in achieving 4 main levels of gloss. LEVEL 1 GLOSS – can usually be obtained at the 100-grit resin bond. The concrete surface will appear as if it’s a smooth but hazy finish with little to no reflection. This level is most common in warehouses. LEVEL 2 GLOSS – is accomplished by using the 400-grit resin bond. The concrete surface will have a low-sheen finish, producing a slight overhead reflection when looking at the floor from an angle. This has also been considered a low-luster matte finish. LEVEL 3 GLOSS – is obtained using the 800-grit diamond abrasive. At this level, you’ll be able to see light reflectivity and from 30-50 feet, the floor will clearly reflect overhead and side lighting. LEVEL 4 GLOSS – is obtained using a 1500 – 3,000 grit resin bond diamond or by using a high-speed burnisher outfitted with specialty buffing pads. At this level, you accomplish a high degree of shine and reflectivity. Reflections have a high level of clarity and the floor almost appears wet from different visual angles. This level is most selected for retail outlets, office spaces or customer-facing businesses. CLASS A AGGREGATE – very little is removed from the surface to achieve this aggregate class. Specifying this aggregate class will yield none to very little aggregate exposure. CLASS B AGGREGATE – approximately 1/16th inch of the surface is ground down to reach this class of aggregate. Specifying this class of aggregate will yield fine aggregate exposure with little or no medium aggregate exposure at random locations. This is also known as a “salt and pepper” finish. This is the most common finish among all industries as it can achieve a better gloss than a Class “A” aggregate as most slabs still require additional finishing/refinement thus requiring more aggressive diamond segments to work out any imperfections. As a result, the additional refinement leads to a deeper cut resulting in the Class B aggregate. CLASS C AGGREGATE – approximately 1/8th inch of the surface is ground down to reach this class of aggregate. Specifying this class of aggregate will yield medium aggregate exposure with little or no large aggregate exposure at random locations. This class enters into a more specialty finish with additional aggregate exposure. This additional contrast of smaller and larger rocks gives off a very beautiful appearance. Additional grinding time is required to achieve this level of aggregate. CLASS D AGGREGATE – approximately 3/16th to 1/4th inch of the surface is ground down to reach this class aggregate. Specifying this class of aggregate will yield large aggregate exposure with little or no fine aggregate exposure at random locations. This is by far the most contrasted class aggregate that can be achieved. This class of slab has been achieved in museums and high-end retail outlets. Our professionals have rated the Class D Level 4 slab as our best-polished concrete finish available today. GET YOUR CONCRETE FLOORS POLISHED TODAY! What are you waiting for? Now that you understand our process a little better and the benefits have been outlined, let’s talk about your space! If you have any additional questions about the polished concrete process itself or would like a FREE quote on your floors, contact us today by calling 972-984-4673 or email us at john.clark@usarenovations.com.